The CGA has an ongoing partnership with SUHSD and ISTEP / California Global Education Project to support the district’s World Geography and Global Issues Course and use it to develop new and innovative ideas for inquiry-based instruction and student engagement. The course has incorporated a year-ending action research project, and this year the work of students was showcased in the first ever Student Conference/Showcase on Issues of Personal, Local, & Global Significance. The event was the brainchild of teachers Kelly Leon and Gina Vattuone, and both the CGA and CGEP stepped forward to help secure speakers, provide refreshments, and offer critical feedback to the students presenting their research. 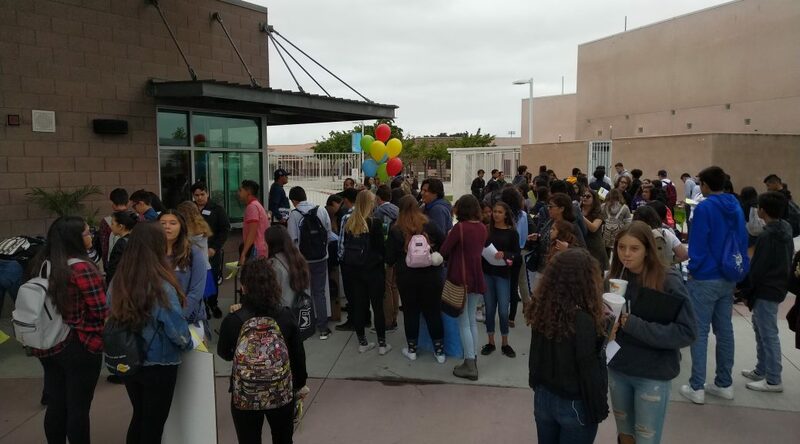 Excited students gather at San Ysidro High School early on Saturday morning. Event sign reflects district’s partnership with CGA and ISTEP/CGEP. 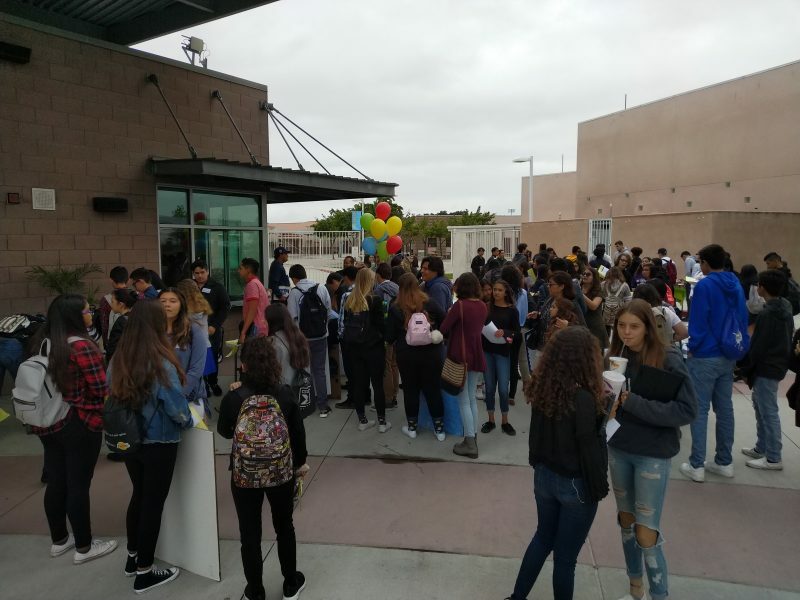 Early Saturday morning on May 12, San Ysidro High was buzzing with students setting up displays at tables placed around campus. Parent volunteers and teachers worked diligently to check-in students and guest speakers at the registration table, answer setup questions, and keep refreshment tables supplied with juice, coffee, fruits, and danish. 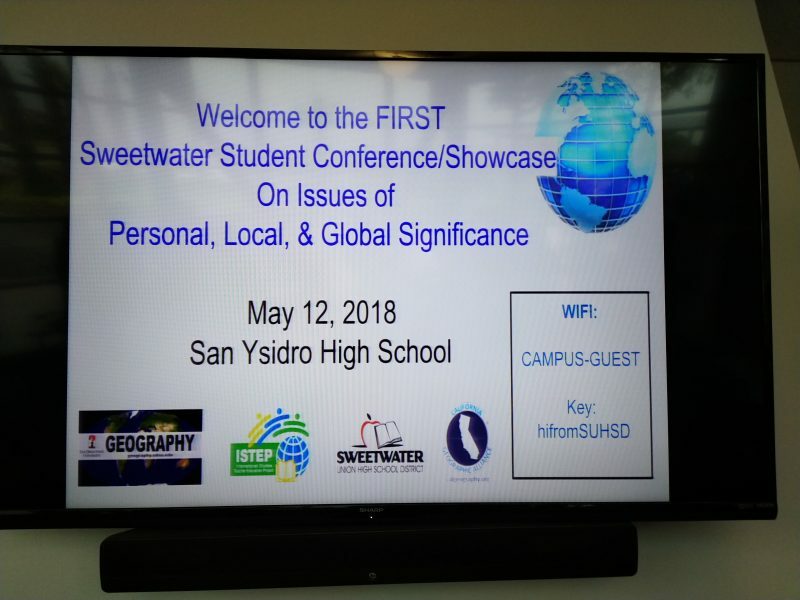 It was clear that something exciting was happening, with over 300 students connected to 60+ displays of research focused on issues identified as a concern by students in the freshman Geography and English courses at several district campuses schools. One school even brought dozens of eggs to distribute as part of their school effort to address community hunger while moving toward a zero waste campus. San Diego State University’s Chief Diversity Officer Aaron Bruce opened the day with a rousing spoken word performance that had the packed auditorium roaring. After his words of wisdom and encouragement, students chose from a variety of informative workshops to attend before reconvening to present and discuss their work with others in attendance. CGA Director Tom Herman served as judge and often had to break into lively discussions among students to ask his own questions about the projects. In the gathering to end the day, with Superintendent Dr. Karen Janney in attendance, sixteen students’ projects were recognized for excellence, but all of the students were congratulated on their ideas and efforts to take on important issues. Congratulations to the teachers and students of Sweetwater for outstanding work and exemplary global awareness!